The Olympia Branch is challenging Mountaineers members to spend a day in service to our remarkable public lands. Learn how you can join the challenge, document your service, and play a vital role in caring for our public lands. As Mountaineers, we enjoy thousands of miles of trails and waterways throughout our public lands. We must set a compelling example as principled stewards who are willing to work hard to maintain the lands we enjoy. The Olympia Branch is challenging you to dedicate one day (or more!) this year to stewarding our public lands. This challenge is a great way to give back to our outdoor playgrounds and meet a vibrant community of volunteers. The Pacific Northwest is blessed with some of the most beautiful and accessible parks, forests, and refuges in the nation. Wildfires, severe storms, invasive species, and diseases all pose threats to our public lands, with climate change magnifying these challenges. Public lands are stressed and threatened beyond the capacity of government agencies and nonprofit conservation organizations to repair and restore their health and beauty. Our wild areas need our assistance. WHY IS THE OLYMPIA BRANCH ISSUING THIS CHALLENGE? The new Rules of Leave No Trace now go beyond minimizing visitor impacts and focus on leaving the trails better than before. The Olympia Conservation and Stewardship Committee embraces this new concept and is challenging all members to do the same. HOW DO YOU TAKE THE STEWARDSHIP CHALLENGE? The Mountaineers offers a variety of stewardship outings every month. Use the "Stewardship" filter on the Activities page to find and sign up for upcoming activities. You can also volunteer with other conservation organizations. Some of these organizations are listed in the link below. For more information on volunteer opportunities, contact the organization directly or contact the Olympia Mountaineers liaison listed beside each organization. We document our hours so we can track and celebrate our stewardship efforts. If you complete a stewardship activity with The Mountaineers, the trip leader's report will automatically log your hours. In addition to Mountaineers activities, we want to capture all the great work we’re doing with outside organizations (e.g. any non-mountaineer conservation organization, such as the WTA or a local Land Trust). If you complete a stewardship activity with another organization, please submit your hours using the Olympia Branch Stewardship Hours Report Form below. Your volunteer hours can also be put towards your Stewardship Badge. This badge is awarded to those who complete 8 hours of stewardship through The Mountaineers or an outside organization. If you complete a stewardship day with The Mountaineers, the trip leader's report will award you with your badge. If you complete 8 hours of stewardship with an outside organization, you can receive your badge by logging your hours on the Olympia Branch Stewardship Hours Report Form. Help the Shadow Lake Nature Preserve by beautifying the grounds and maintaining trails through the removal of invasive weeds and pruning native species. The Annual Conservation Committee and Stewardship Development meeting will feature a visual report on 2018 activities as well as planning for 2019 trips, courses, and adventures in stewardship. Join us for this Crosscut Saw certification class in Hoodsport for Mountaineers wanting to meet the US Forest Service’s National Saw Standards. This training prioritizes Olympia Branch members who want to help clear trails in the Olympic National Forest and elsewhere. Course participants are expected to sign up for Olympia Branch trail maintenance trips where crosscut sawyers are needed. Every year, over 400 student delegates (grades 3 through 12) participate in this very special environmental learning day held at The Evergreen State College. 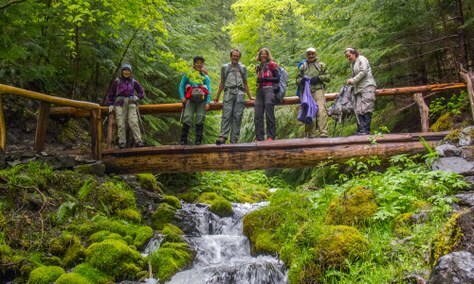 The Olympia Branch is seeking instructors for two different hands-on workshops - The Science Behind Hiking Safety and Wilderness Ethics and Environmental Skills for the Outdoors. Join a contingent of Mountaineers on this fourth "Tiger Mountain Sunday" work party with the Washington Trails Association. We will be on the High Point Trail working on important drainage structures and performing annual maintenance. Help the Washington CoastSavers clean up Shi-Shi Beach on Earth Day!